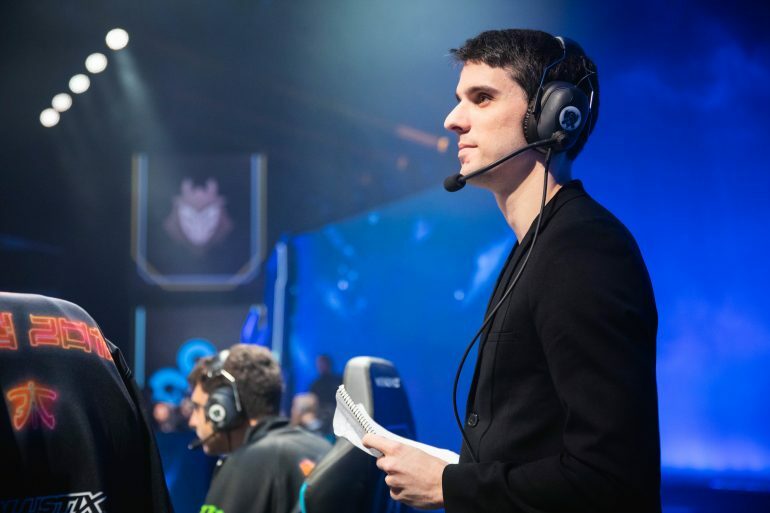 Schalke 04’s League of Legends head coach Dylan Falco hasn’t had the best start to 2019. After coming off an impressive world championship appearance with his former team Fnatic last year, Falco switched teams and began a new project with Schalke. Following an initial few weeks of dominance, Schalke seemed like potential title contenders and looked certain to be heading to playoffs. But everything seemingly fell apart after a loss to Origen in February. Schalke continued to pick up loss after loss, forcing them slowly down the standings until they eventually fell out of playoff contention. Now, with the Spring Split wrapping up, Schalke have plenty of time to look back on their season and make changes before the Summer Split to try and get into the playoffs and even challenge for a spot at Worlds. Before the next round in the 2019 LEC Spring Split Playoffs, Falco talked with Dot Esports about the season as a whole, as well as what the team’s plans are for the future. How do you feel your first season as Schalke’s coach went? Dylan Falco: Working with Schalke and entering a new team environment has been an easy transition and a positive experience, the staff and players are great to work with. Ultimately though, I’m disappointed with our results in the Spring Split. I feel that, had things gone a bit differently, we could have shown much stronger results. Schalke obviously had a great start to the season before results started to become less positive after your loss to Origen at the start of February. What do you think changed or happened that led to such a poor run in the second half of the split? I think in the first half of the split, our coaching staff and players shared a clear vision on how we wanted the game to be played. This was all-encompassing, from draft, early-game into late-game. With the benefit of hindsight, a combination of patch changes, and a few poor performances on stage led to a lot of questioning as to how to play. In addition, I think some of our weaknesses in mid-game simply weren’t exploited early in the season when teams were a lot less refined in their play. What does Schalke need to do differently next split to really challenge for a playoff spot? We will be doing an extensive rebuild of our approach to practice and gameplay for the Summer Split. We plan to start practice early. Both staff and players are highly motivated to start Summer Split strong. We’ve learned from a lot of our shortcomings in the last half of Spring Split, but still know that we have the potential to play at a high level from our early games in the split. How has Felix “Abbedagge” Braun coped with the LEC in his first season? How has he gelled with this Schalke lineup? From watching Abbedagge play for the entirety of the split in both scrims and stage, I think that he is a very gifted player. From the start of playing with Abbe, he was able to stand mechanically versus the top mids in the league. This is a very rare trait. I do think that translating his scrim play to stage was difficult at times—especially in the second half of the split. I think this is completely common for the first split of a rookie player. Also looking back, I feel that coaching staff could have definitely optimized and managed our drafting strategies toward mid a bit better. Can we expect to see any surprises next year from Schalke? Yes, there will be some surprises from Schalke, but I don’t think there’s anything I can spoil now. Stay tuned. Which team do you think has the best chance of winning the playoffs and why? I think it’s a very hard choice between G2 and Fnatic. Ultimately, I’d give the edge to Fnatic, as I think the roster has a lot of experience together in best-of-five scenarios, and played better in the second half of the Spring Split. Were you surprised by Fnatic’s resurgence in the second half of the split after their rough start to the season? Despite the changes from 2018, Fnatic still has four members coming off of a World finals run. I think that it would be much more surprising if they didn’t pick it up at some point. What do you believe caused that poor start from the team? As someone who worked with Fnatic, I know that they have always had a philosophy of starting practice slowly, later than other teams, and ramping up throughout the split. Both splits in 2018 had weak starts. I think adding into this the loss of such a central player such as Caps was a lot for them. They had to work out their entire approach to the game while losing on stage. This can be pretty hard and taxing on the mentality of players. What should Schalke fans expect to see from their team in the Summer Split? I have full confidence that with some time to reflect and regroup, we will come into Summer Split strong, just as we did in Spring Split.